Boyer presents Back in Time (BIT) snapshots from her colleagues, some of Tarot's best-known writers and deck artists who relate their own experiences with the BIT Method that range from comical and msyterious to sobering. 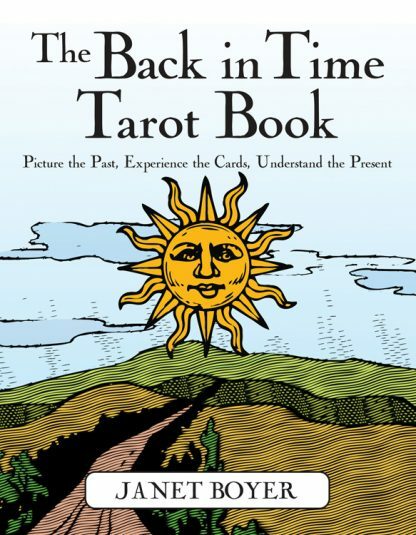 Providing more than 100 exercises and referencing more than 40 Tarot decks, The Back in Time Tarot Book draws on personal examples, headlines, television, music, and fairytales, allowing Tarot to be appreciated in a fresh new way. The BIT Method does not follow that there is only one way to see Tarot cards now and in the future; rather, it encourages readers in their own abilities to recognize what is important in the cards. The contributors include Nina Lee Braden, Joan Bunning, Wilma Carroll, Ann Cass, Elizabeth Cunningham, Lon Milo DuQuette, Josephine Ellershaw, Mary K. Greer, Lisa Hunt, Mark McElroy, Teresa Michelsen, Riccardo Minetti, Phyllis Vega, and Zach Wong. In addition to authoring The Back in Time Tarot Book and creating the BIT Method, Janet is a prolific writer and reviewer, having posted more than one thousand reviews and articles to JanetBoyer.com, Amazon.com, and elsewhere. She is the editor of the 2009 Tarot World Annual (TWM Publishing), as well as an editor at TheTarotChannel.com. As if that isn�t enough, she also performs intuitive Tarot readings for her worldwide clientele via email through her website JanetBoyer.com. To read freshly brewed BIT Snapshots using her innovative Back in Time Method, check out Janet�s column in the quarterly print publication Tarot World Magazine. Janet loves learning, books, autumn, chocolate, trees, coffee, mysteries, thriller movies, the prog rock band RUSH, and her Tanjberry Library. She adores the Ten of Cups life she shares with her precious husband and son (whom she home schools) and their two fur balls in the beautiful state of Pennsylvania.